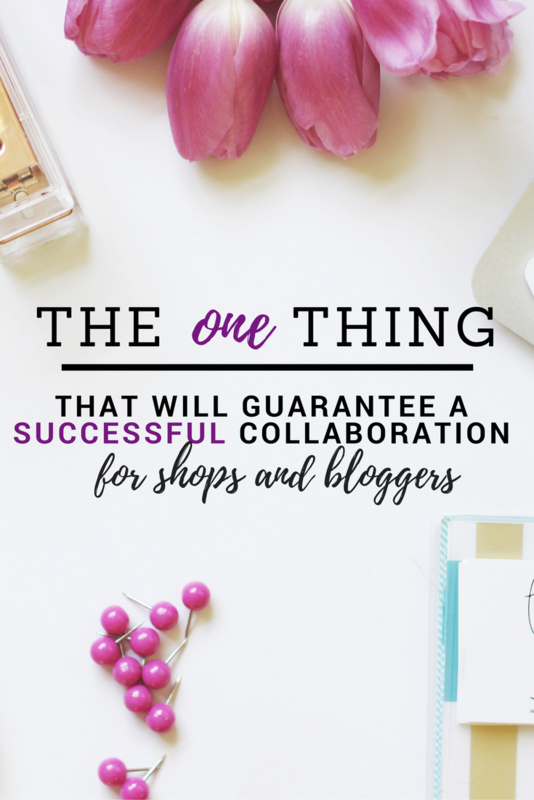 Collaborations are currently the name of the game in the blogging world. I love working with big brands and supporting small shops - and doing so in a collaboration is my all time favorite because the definition of a collaboration is that both parties are benefiting. By building a relationship and working together, both the shop/brand/business and I are getting our names out there to a larger audience. What's not to love about that? After three years of blogging, I've had the benefit of hearing about collaboration highs and lows from both my fellow bloggers and my colleagues who own businesses. As bloggers, one of the highlights of our jobs is to work with brands that we know and love (or discover amazing new ones). Unfortunately, and I hate to say this, many of the business owners who have shared their experiences of collaborating with bloggers have not always had positive things to say. I often hear, "well, I sent Blogger X this product or that item and all she did was Instagram it." Shockingly, not one person has said yes. I honestly don't understand the concept of providing product or service to someone without discussing openly and clearly what it is you hope will come of providing said product. All bloggers work differently, but I know one thing for sure: we all want to deliver on each venture that we agree to. I will speak for myself and say that I would never want to under-deliver in a partnership and not know that the shop felt that I had done so. Sadly, if a project isn't agreed upon in writing, all anyone is working from is assumptions. Let's say Shop ABC assumes that if they send Blogger X product, then Blogger X will blog it, share on all social media channels and promote it fully. What Shop ABC may not know is Blogger X's rates, process when working with product to review or Blogger X's collaboration calendar. On the flip side, if Blogger X is approached by Shop ABC and told Shop ABC would love to send over product without any other detail, Blogger X is going to assume that there are no requirements. If a sponsorship or collaboration has requirements such as shares on certain channels or a full blog post, it's discussed up front so that all parties can agree on the terms and compensation. So what do we do to avoid a situation where everyone is left disappointed? A Scope Of Work is simply a document that is drafted to cover each and every expectation of a collaboration. It could be as simple as a clear, bullet list via email or a document you whip up with your logo and color scheme. No matter what it looks like, the Scope Of Work is the one way you can guarantee that both you and the brand/shop/company you are collaborating with are happy throughout the process. I am so excited to work together! I thought it would be easiest to jot down our collaboration details in one place, so I drafted the following Scope Of Work. Take a peek and let me know if I missed anything or if we need to revisit any of the details. *Shop ABC will provide Olive and Tate product x and $___ for a full blog post review and social media shares across all channels. *Olive and Tate will include 3-5 original, high resolution, styled images in the blog post which will only feature product. *Olive and Tate will share one image across all social media channels including hashtags and tags requested by shop. *Shop ABC will re-gram one of the post images and promote post across social media channels. *If product for some reason does not meet expectations, product will be returned to Shop ABC by Olive and Tate in new condition. I usually make sure to go through the emails that have gone back and forth between myself and the brand and fill in the details I know and establish what I don't. For example, if a publish date hasn't been discussed, I look at my calendar and pick a date that works for my blog timeline and include it. If it needs to be changed, we discuss and change it, easy as pie. If you have a media kit, you most likely have all of the above details hammered out for your post packages but details can be overlooked during the negotiation process, so I still suggest creating a final Scope of Work for each collaboration you participate in - think of it as your safety net for your blog business. Once both the brand and I feel that our goals and specifics are covered in the Scope Of Work, we move forward with shipping product or beginning our partnership. I can say, with absolute certainty, that I have never regretted creating a Scope Of Work and have, in fact, gone back to reference it during many collabs to make sure that I was on track with my deliverables. Whew, that was a lot of info but I know you'll take it and run with it! And P.S., shop owners, you can do this too! Provide a Scope Of Work when you start any collaboration to ensure that your deliverables are met as well! In fact, my first experience ever with a Scope Of Work was during a collaboration with a local business and I haven't looked back since! I love your advise! Thank you for sharing! Thank you so much, this has been so helpful! I love that you provided an example of the contract! Thanks for sharing. This is gold. Pinning to use later for sure!